AVAILABLE IN SIZE XS, S, M, L, XL OR XXL! The Pro Team Rain Vest is an essential piece of kit for days when the weather looks changeable. Packing down into a jersey pocket, it is less bulky than a jacket and will keep your core protected should rain set in. A pared-back take on the popular Pro Team Race Cape, the Rain Vest uses the same breathable and waterproof fabric by Polartec which is new and improved. A dropped tail keeps road spray off the back of your jersey, and the fabric has a slight stretch to allow the vest to keep its shape over fully-loaded pockets. It also shares the same Pro Team race fit as the Race Cape. As with most of our Pro Team products, this vest was designed in response to a direct request from our teams - in this case Team Sky - for a versatile, protective garment with minimal bulk. Race-proven breathable, waterproof Polartec fabric. Zip pocket [not waterproof] on left side. Reflective details on front and back. Packs down into jersey pocket. 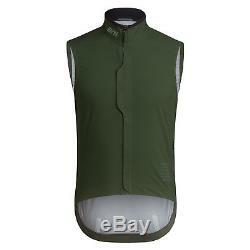 The item "Rapha Cycling Pro Team Rain Gilet Vest XS S M L XL XXL Waterproof Light Aero NEW" is in sale since Sunday, May 6, 2018. 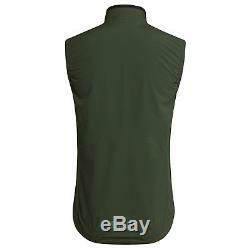 This item is in the category "Sporting Goods\Cycling\Cycling Clothing\Vests".r" and is located in New York, New York. This item can be shipped worldwide.